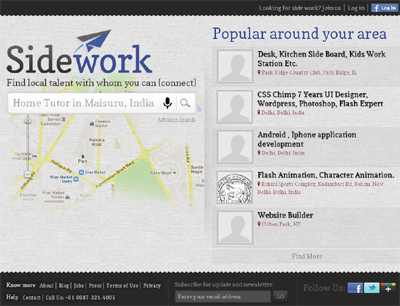 Sidework.in helps to connect local talent with people who are looking for skilled people. Basically, Sidework provide options to skilled people to list their work profiles i.e a Tutor, T-shirt designer, Car mechanic, Web designer or anyone who looking for a opportunity to publish their skills on the internet and find a opportunity where they can fetch some additional work. Sidework is free for everyone and we aim to provide best service in providing great work to everyone! Sidework is clean ads free and using very nice interface to provide exactly what it aim for.